I have been anxiously awaiting the return of the swallows to the Avimor Town Lakes. Last year there were hundreds of them during the Spring and Summer months. Swallows are very beautiful as you will see from the pictures below. It just takes some patience to enjoy the varieties of color and species. On Friday morning, 24 April 2009, while I was moving into my new Avimor home, I saw a couple dozen swallows swooping over the ponds. By that afternoon they were gone. I havenn't see them all weekend, nor today. Weird! Anyway, so when the swallows do make their seasonal return and stay for a few months, here are some identification tips to help you figure out what we are seeing. Focus on color pattern and tail shape and that'll get most of them. The Barn Swallow is probably our 2nd most predominant swallow at Avimor. The House Finch eggs on the back of the Liberton model home have hatched. These are the first spring baby birds at Avimor that I have seen. Normally, two to four eggs are laid and incubated by the female only for 26-35 days. Young start roaming from the nest onto nearby branches at 6 to 7 weeks, when they are called "branchers", but cannot fly well until 9 to 10 weeks old. They are fed for another few weeks as they are slowly weaned. Families remain loosely associated during summer before young disperse in the autumn. Adults tend to remain near their breeding areas year-round while juveniles disperse widely, over 250 km (150 miles) in the autumn. Territories are maintained by the same pair for as many as 8 consecutive years, however, these Owls are solitary in nature, only staying with their mate during the nesting season. I first saw Momma-Owl on the nest on March 18th so we are now coming up on the week where the owls should hatch. Over the last couple of days I have been noticing the birds up on the roofs of the homes at Avimor. Robins are regulars on the roofs. The pair of Say's Phoebes are still flitting about the roof tops. Occasionally I'll see Kestrels, Starlings, and Red-Winged Blackbirds up on the roofs too. But the two most interesting that I have seen in the last two days were Killdeer and Quail, birds which are most commonly found on the ground. The California Quail were on top of the Sales Office roof this morning when I came to unlock and I have seen the Killdeer on a couple of different homes. Strange behavior! I have been able to observe a Red-Tailed Hawk nesting high atop the power pole across from the Avimor Water Reclamation building. If you have a spotting scope, you can see it really well. I believe a pair of Red-Tailed Hawks are nesting up in some taller trees in the draw running east of the water reservoir. Momma-Owl is still sitting diligently on her nest. I'm so anxious to see the chicks. For the second year in a row, a House Finch has nested in the fireplace vent of the Liberton Model home. We don't use the fireplace, so there is no danger. I removed the old nest and tried to block them, but within a week a new nest was built with eggs in it, so we'll wait until the finch chicks fledge and I'll take more permanent measures to keep nests out of where they shouldn't be. The Robins seem to have found some nest sights in various trees around the model homes and along the creek. Eurpeon Starlings have created a nest in our framing contractors crane. We'll see how long they last there. Almost every tree cavity along the creek has a Starling nest in it. It shouldn't be long before the Orioles and Swallows are back and nesting too. Special thanks again to Michael Wiegand for conducting the birdwalk in my absence. It sounds like it was a good one with the new Avimor resident kids becoming familiar with the beautiful birds and plants all around them. After all the wind and rain the last few days I've been anxious to see what bird activity was happening. I was delighted to find a Say's Phoebe on the roof of the Newmore model home. 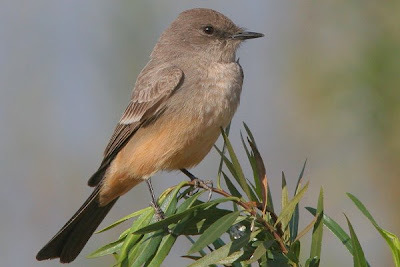 The Say's Phoebe is part of the Flycatcher family of birds and you can see them occassionaly perched low on plants or fences near open areas where they hunt for insects. They also like to build mud nests on homes and buildings. Also observed this morning was a pair of Northern Flickers, California Quail, lots of Red-Winged Blackbirds including females now, American Goldfinch, House Finch, lots of European Starlings, American Robins, Dark-eyed Juncos, Killdeer, American Kestrels, Mourning Doves, and of course our resident Great-horned Owl. The amount of downy feathers is piling up on the owl nest and I have heard of people observing owl fledglings in other parts of the state, so it may not be long before we have our own hatchlings. With all the new technology like iPhones, iPods and Zune players and all the cool applications that come with them like BirdJam and digital field guides like iBird we have all kinds of new ethical dilemmas. Scientists have long used bird-call playbacks on cassette for their studies, but now potentially every birder out there can play bird calls and songs with ease. Luring the birds in with portable speakers and an MP3 player does indeed reveal that more birds are in a given area than you might otherwise see. I never knew that so many Spotted Towhees were in the willow dominated riparian draws where I live until I played their call and they seemed to be everywhere. But is it right? Does playing bird calls stress out or endanger the bird or their offspring still in the nest? Does it mess up their mating and migration patterns? Does it confuse or disorient them? Does anyone really have answers for these questions? The BirdJam website has a page dedicated to the birding ethics related to using their product. I generally agree with what they have to say. The science is still out...I haven't seen a study that says attracting birds with their own sounds has negative effects. Common sense does tell me not to play the sound over and over and over and not to play it around nesting birds or other birders not in my group (unless you want to play really mean, but fun-spirited practical jokes by playing rare bird sounds). I find that some people are overly-sensitive to these disputatious issues. Disturbance to the birds by mankind in this regard I suspect is very minimal and would not affect for long their daily habits, no more than a passing coyote or bird of prey. Feeding wild birds probably has more of an impact, positive or negative, than a few seconds of hearing another bird of their same species. I am open to anecdotal and scientific evidence to the contrary. Now I don't play my BirdJam in the field as much as I did when I first got it. I use the Stokes bird songs on my computer while in my home when I prepare to go after a target bird to learn its calls and songs. I admit that a handful of my life birds are the direct result of BirdJam and I have a clear conscience knowing that my employment of such a device was done reasonably and responsibly. 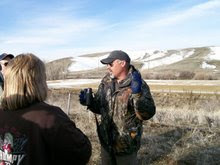 Do the benefits of better understanding bird distribution by knowing elusive birds are there outweigh the disturbance? I have been keeping a list of which birds react to the playbacks and how they react. I'll post or publish my findings at some future date when I have collected more data. Hopefully others out there are doing the same and we can pull our results together and come to some better conclusions about the effectiveness and bird safety of this now more prolific technology. This topic would make for a great doctoral thesis for some aspiring ornithologist out there! How do you feel about this issue? Do you have any experience for good or bad in this arena?